*Reception is only available until 5:00pm. There is nothing more important than taking care of your own health. If you are recovering from an injury, trying to improve your mobility, or simply feeling a little run down; you might want to stop by Pinnacle Health Group. We are invested in helping you achieve your health goals. Our services offer a holistic approach to your care. We employ dieticians, myotherapists, podiatrists, and other specialists to ensure you get an accurate view of your health. That’s why physio at our Docklands location is such a wonderful experience. In the interest of serving our clients well, we try to consider every factor that might prevent you from following through on your wellness care plan. One of the biggest obstacles our clients face is finding the time to maintain a routine. That’s why we’re so excited to have multiple locations across Melbourne, and our Collins street location is perfect for busy professionals. Many of our programs and treatments can be completed in a half hour, although some may take up to a full hour. This ensures that you are able to stick to your commitments even on your busiest days. If you’re still having difficulty keeping up with your plan, schedule an appointment with our staff and we can work with you to create something better accommodated to your lifestyle. It’s worth the time to create a feasible plan with our physiotherapists. They can help you understand exactly which programs and services will work best for your needs. Not only that but our treatments are designed to improve your daily life by improving your health. Clinical Pilates can help to relieve body aches and pains by strengthening your core muscles, which will also improve your posture. We also offer Yoga sessions for better balance and an improved state of mind. There is no end to the improvements you can create with a good physiotherapy. Whether you’re learning to walk again, or you just want to lose some weight. It can be so easy to make excuses for short-changing ourselves. There’s not enough hours in the day, the house needs looking after, work and family come first. The truth is, you’re putting work and family first by putting your health first. You can’t perform consistently for work if you are in poor health, and the time you have with your family is limited by how well you care for yourself. Taking care of yourself is something that benefits everyone who relies on you, family and co-workers included. We promise to do everything we can to help you create a better life through better health. We know that people are busy, and we understand the demands that are placed on your time and attention. That’s why our services are designed around your convenience and your specific needs. We’re here to help you design a plan that works for your life, and we’ll be right there encouraging you through every milestone. Give yourself a treat and experience physiotherapy at the Docklands. Our staff is ready and waiting to help you achieve your health goals. Book a consultation or try one of our yoga classes today! 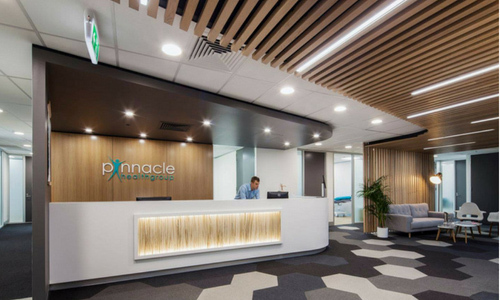 Pinnacle Health Group is Melbourne's best physiotherapy centre. We have offices in Collins St and Docklands. We offer physiotherapy, clinical pilates, massage and myotherapy. We also offer corporate health and wellness. Visit our website or give us a call to learn more!